From all points east or west: Take the Long Island Expressway to Exit 68 North – William Floyd Parkway. Shoreham -Wading River High School: Continue on William Floyd Parkway north to the end, route 25A and bear right, heading east on route 25A. The High School entrance is 1/8 of a mile east at the first traffic light. Make the right at the High School entrance. Proceed along the driveway to the High School and the North Shore Public Library. The first left on the high school driveway will bring you to the District Office. Parking is on the left side. Albert G. Prodell Middle School: From all points east or west: Take the Long Island Expressway to Exit 68 North – William Floyd Parkway. Continue on William Floyd Parkway north to Whiskey Road and make a left. At the second stop sign make a right and head north on Randall Road approximately 1.5 miles. Pass the Leisure Glen development on the left and St. Mark’s Church on the right. 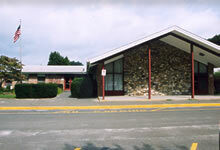 The Middle School entrance is on left side. From Route 25A head south on Randall Road approximately 0.8 miles. The school entrance will be on the right. Briarcliff School: Continue on William Floyd Parkway north to the end, route 25A. Make a left and head west on route 25A approximately 1.2 miles to Randall Road. This is the third traffic light. Make a right and head north on Randall Road. Randall Road becomes Briarcliff Road. Continue on Briarcliff Road approximately 0.8 miles. The school entrance is on your left. Drive up the hill and the parking lot is on your left. Miller Avenue School: Continue on William Floyd Parkway north to the end. Make a left onto Route 25A and head west. At the first traffic light make a right onto Miller Avenue. Continue 2 ½ blocks. The school entrance will be on the right. Make a left at the traffic light and head north on Wading River Manor Road. The school entrance will be on the right.